Free Comic Book Day 2015 Tick! 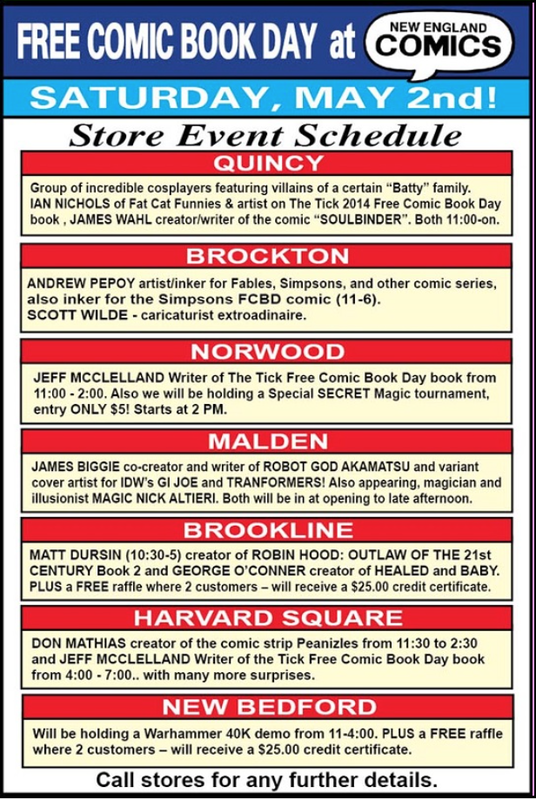 Plus signings at New England Comics! Be sure to head out to your favorite comic shop this Saturday and pick up a copy for free! And there are probably some other free books being released at that time. I guess. So it looks like I'll be at NEC Norwood from 11:00-2:00, and NEC Harvard Square (my favorite location) from 4:00-7:00! I will most likely have a signing on Sunday late morning/early afternoon at one of the other stores, though I'm not sure about those details just yet. Keep checking www.newenglandcomics.com for more details. Happy Free Comic Book Day! Go get some comics! 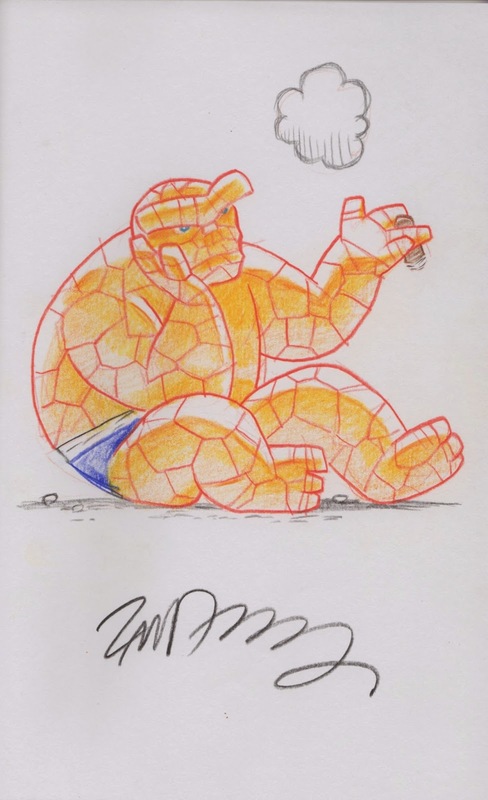 So many great Thing sketches in this round of the Thing sketchbook show...thing. This might be the best grouping of five consecutive sketches yet...though I suppose I've said that before. There are some great ones, though, to be sure. Check 'em out! After pulling in a half dozen sketches at Comic-Con in both 2012 and '13, for some reason I returned from San Diego in 2014 having added only one Thing sketch to the book. But what a sketch it is! This beauty, done entirely in colored pencils, is by Zander Cannon, perhaps best known for his work on the graphic novel Heck! and his work on the America's Best Comics line with Alan Moore. I know him best, though, for his short lived Chainsaw Vigilante series, a spinoff of the Tick line. The rounded figure and the stubby arms and legs really make this piece for me - along with, of course, the beautiful bright orange and blue. I worked with Dani Grew during my time volunteering at the Toonseum in Pittsburgh. Dani is an artist in residence at the museum, and she does a lot of work in coordinating the various exhibits as well. I was hesitant to ask her to draw something in the sketchbook as I wasn't sure if she's want to do it or not...but as always, my desire for Thing sketches overrides any semblance of manners or couth. And this time, my lack of social grace paid off in the form of this great sketch. I love the subway figures to each side and how expressive everyone is. One of my big regrets of going to Detroit's Motor City Con was forgetting to take the sketchbook with me. I partially made up for it by buying a blank cover and having Katie Cook draw on it, but it's just not the same as getting something in the ol' sketchbook. When I saw that Cook was coming to the Pittsburgh Comicon in 2014, almost four years after the Detroit show, I knew that I had to add a sketch and I was lucky enough to grab this great, tiny watercolor before I ran out of pages. Let's check out that sketch cover! Okay, obviously the scrapbook joke is a theme of Cook's, but I'll go with it. Now that I think about it, I have a few of these blank covers with sketches on them. 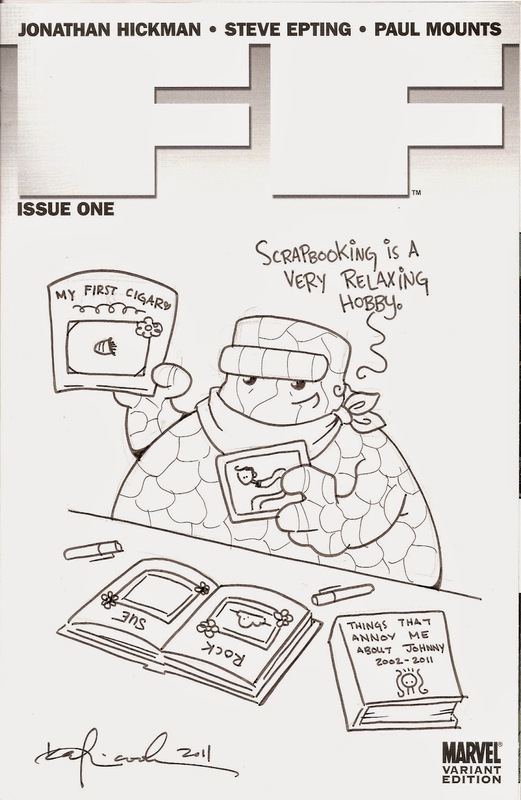 Maybe one day the world will be ready for a sketch cover post. Who can say? I made it back to the New York Comic Con in 2014 and was able to spend one day at the show. NYCC is always packed to the gills with people and it's hard to see everything in one day, so I try to make a point to add one sketch into the book when I go there - there's usually not time to get more than that unless that's what I want to do all day. 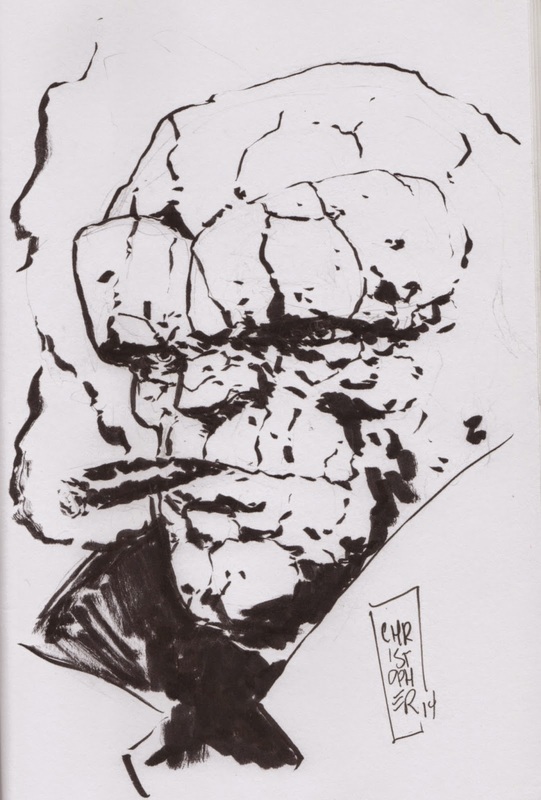 Anyway, this year I was able to get a sketch from Christopher Peterson, a fellow FUBAR alum who has gone on to work on some fairly high profile books. Here we see another appearance of the Thing with a trench coat, which I am always grateful for. This is a very moody piece! I think Christopher was happy with it and I certainly am as well. It's pretty difficult not to just stare at this piece when I look through the book. 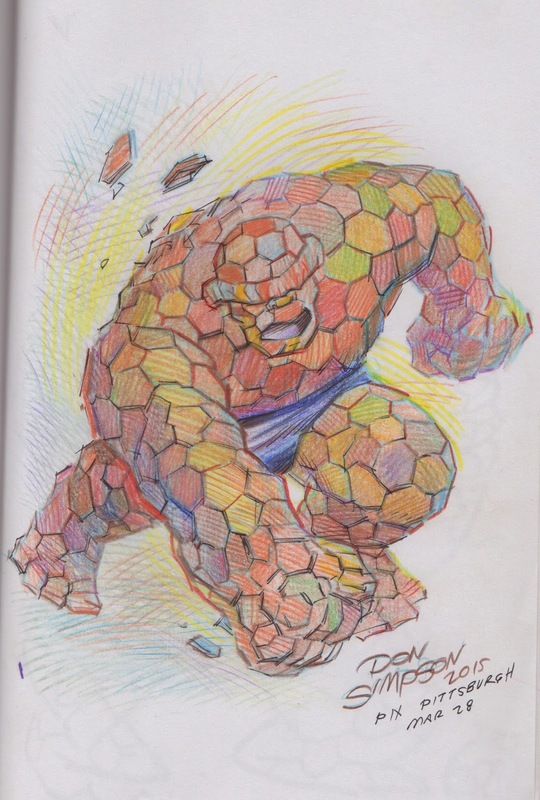 It's a full-figure drawing, it's in wonderfully rendered color, it's by Megaton Man creator Don Simpson...and it's the Thing! It's hard to find fault in any of those reasons. It's difficult to rank the drawings in the book, but if I absolutely had to, this would certainly occupy one of the top spaces. Not only did I get to strike up a conversation with Don, but I at least hold out a little bit of hope that one day we may work together on something fun. For certain, he drew one of the signature pieces for the book, and I couldn't be happier with it. It's, in a word, incredible. It'll be hard to top these five as a group. We'll see what I can do with the next batch, some of which have yet to be drawn! The triumphant return of RANDOM NOTES!! Steel City Con, FUBAR, Kickstarter, Franks and Beans and more! 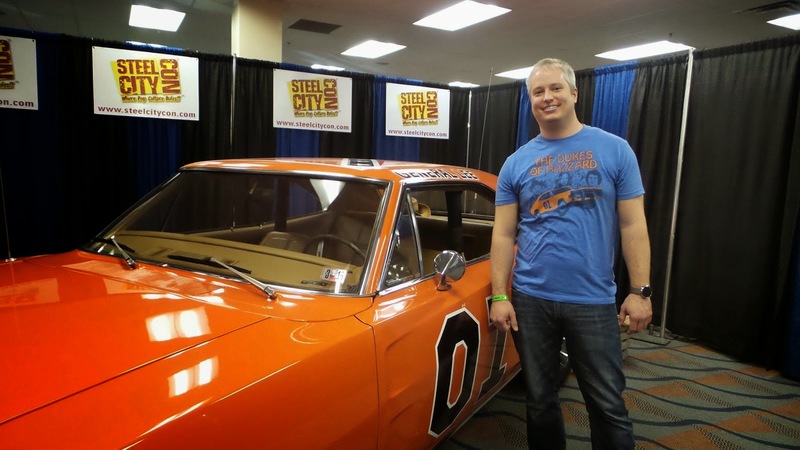 - The latest of the installment of the Steel City Con was held at the beginning of April. I'm continually surprised at how popular this show has become. There are three shows a year and you'd think it'd suffer from fatigue by this point, but it seems to still be gaining steam. It'll be interesting to see how it holds up after the Wizard World Pittsburgh show later in the year. I was able to snag a few cool items from the show, including some Thing items and some comics. All of these books were around 50 cents each, so I grabbed about 40 of them and spent way too much time looking through boxes...but there were some cool finds to be had, including Superboy #101 (in rough shape, but still), the last issue of Strange Tales vol. 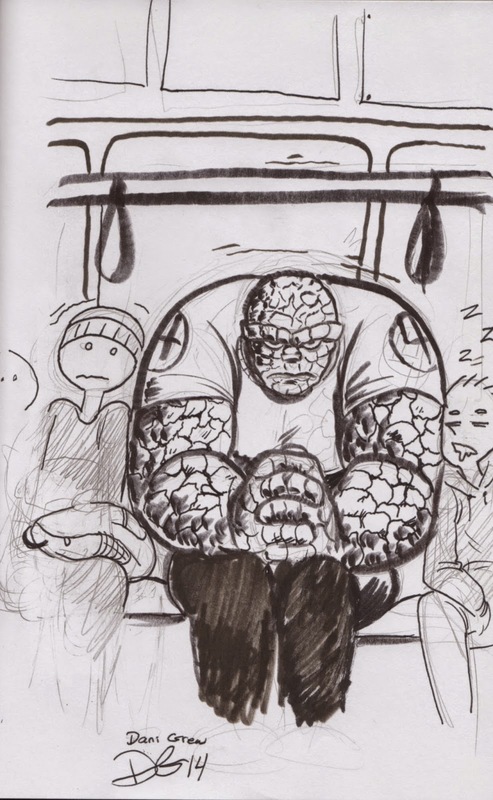 2 (the only issue of the series that featured the Thing, a mainstay in the first volume) and the second issue of Simpsons Comics. There was also a big Dukes of Hazzard presence at the show. Larry wrote more about it on his blog, and you should check it out! - I'm pretty sure this Thing magnet is homemade, but when I saw it at Pittsburgh Comics I had to grab it. I can't quite place the artist, and it's driving me nuts. Needless to say, I love it. - The Pittsburgh Indy Comix Expo came and went at the end of March, and it was better than I expected. I managed to sell some books and buy a few that came home with me. There was a lot of talent at this small show, which was encouraging. I also met Don Simpson there, and we struck up a dialogue, at which point I learned that he...works at the same school that I do. That is really bizarre. 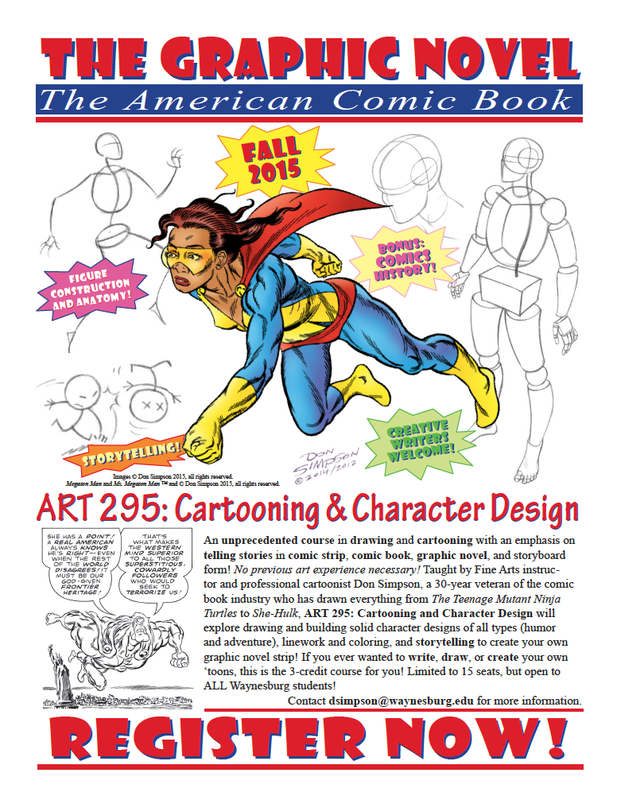 Don is offering up a class for the fall semester in cartooning and character design. This would be an awesome class to take. - The second volume of Jennie Wood and Jeff McComsey's is currently up on Kickstarter and it's nearing its goal. This is a great book and a the kind of comic the industry needs more of. Check out the campaign and pledge if you can! And speaking of Kickstarters...the UHF movie campaign is nearing its end with some work to be done. It's finished on the evening of Sunday, April 26th, so if you haven't pledged yet...there are only a few more days to do so! Some of the rewards for the campaign are making their way to me, including these 8-bit pins featuring characters from the movie. - I'm currently catching up on some lettering work. 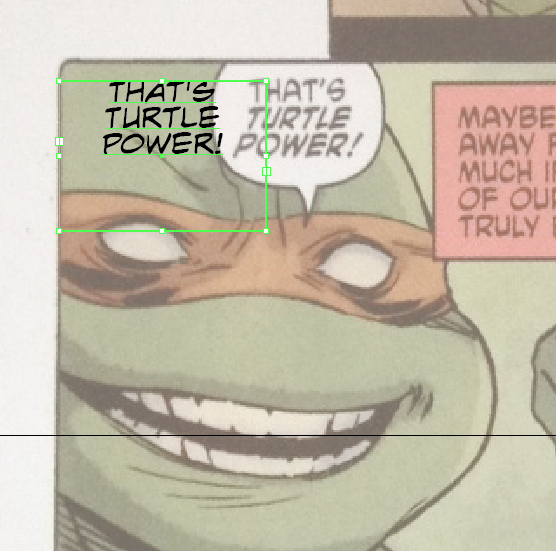 Whenever I letter, I use a page from IDW's Teenage Mutant Ninja Turtles comic as a template. I type in "that's turtle power!" every time I start a new project to make sure that my letters are the size they should be. This continues to amuse me, so I'm sharing it. 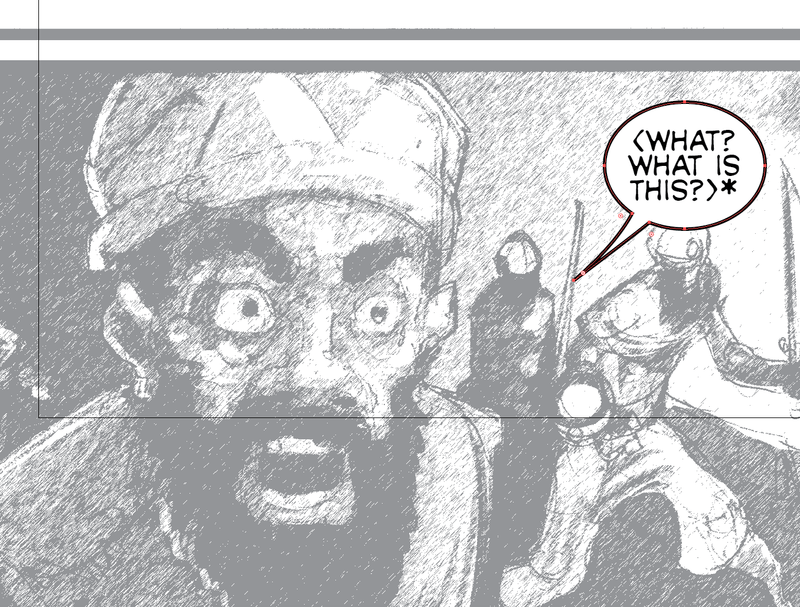 Just what am I lettering? Among other things, some FUBAR for the By the Sword collection, including this short story titled "The Leper King", written by Mark Bertolini with art by Chris McFann. - And lastly, there's a newly released, really short episode of Franks and Beans to watch! This episode was originally released as a Vine, hence the brief time limit. There's also a loop of the video (100 times, over and over) in case you want to feel the cold grip of insanity. Wow, these random notes are fun. Look for them again whenever the hell I feel like writing them. See you then! This one goes under "how did I forget to post this before now?" Because I have categories like that, in a filing cabinet, next to my desk. Whatever. 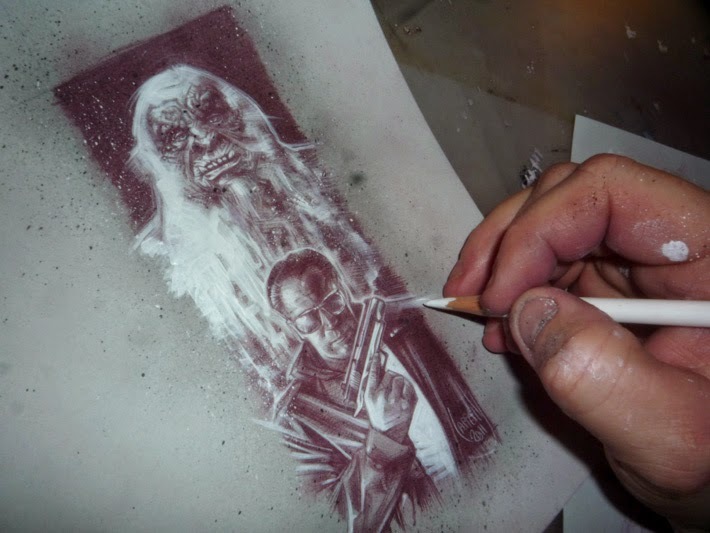 Jeff Lafferty is not only a great artist, and not only a great guy, but he's a great artist who's a great guy who has drawn Teddy and the Yeti before. He's also drawn Doom 2099 for Marvel. I wonder if he gets tired of me saying that, because it's not like he hasn't done other, more impressive things in the years since then...but I guess I just can't let some things go. I wrote about this briefly at the time, but since then, Jeff has created a YouTube video that shows off his process in creating the image (with some of that space age time lapse video, too), and it's worth a look, even a few years after the fact (and he name checks Franks and Beans!). Thanks again to Mr. Lafferty for producing such a fantastic image of these characters!